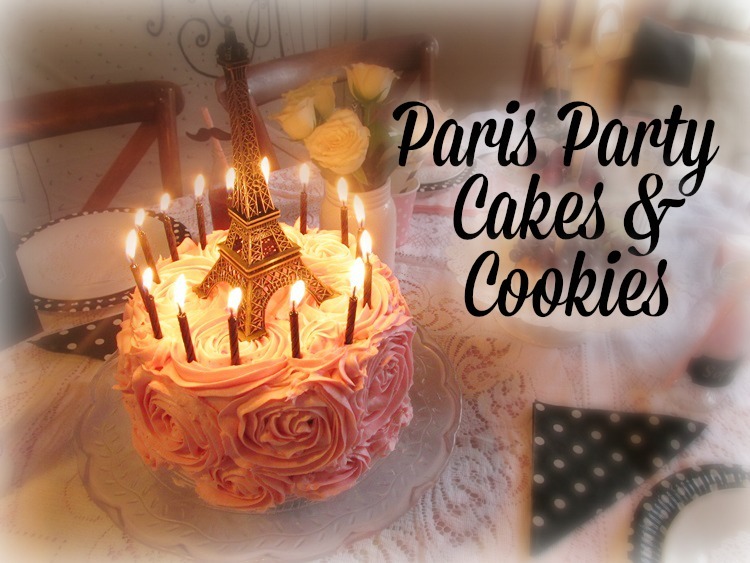 Today I'm going to share with you how to create beautiful (deceptively simple and gorgeous) cakes and cookies for a Paris Party. Last year's Café de Paris 11th birthday party was one of our best ever. It was fabulously gorgeous AND fun. 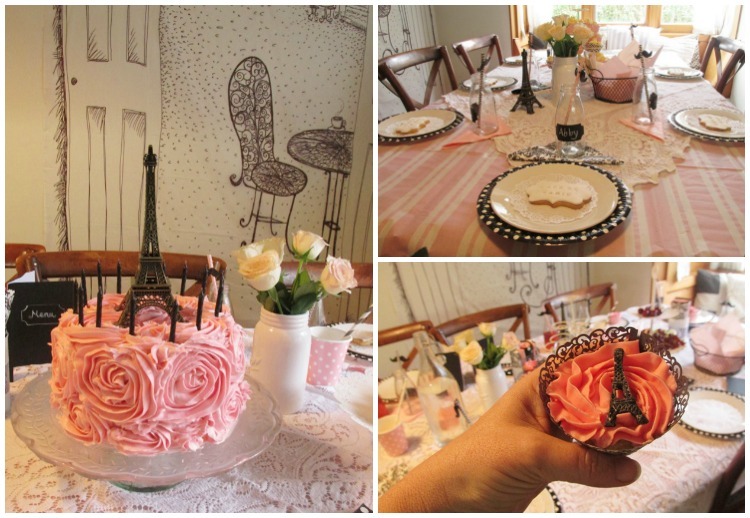 I'm going to deliver the final installment on how to recreate this party by sharing with you how to make the Rosette Birthday Cake, the Eiffel Tower cupcakes and the gorgeous Café de Paris Cookies. This is a post for beginners. If that sounds like you - this how-to post is for you. If I can do it, so can you (with the right equipment). Pulling off these creations is totally doable by amateurs like me, as you will see. No need to spend gazillions on professionally-created delicacies in order to pull off a pin-worthy scrumptious party. Invest the moolah you'd otherwise spend in getting a few cake decorating essentials for yourself, that you can use again and again, year after year. I am far from an expert cake decorator. My hand shakes and my rosettes are a bit wobbly, but the overall effect was amazing when it all came together. 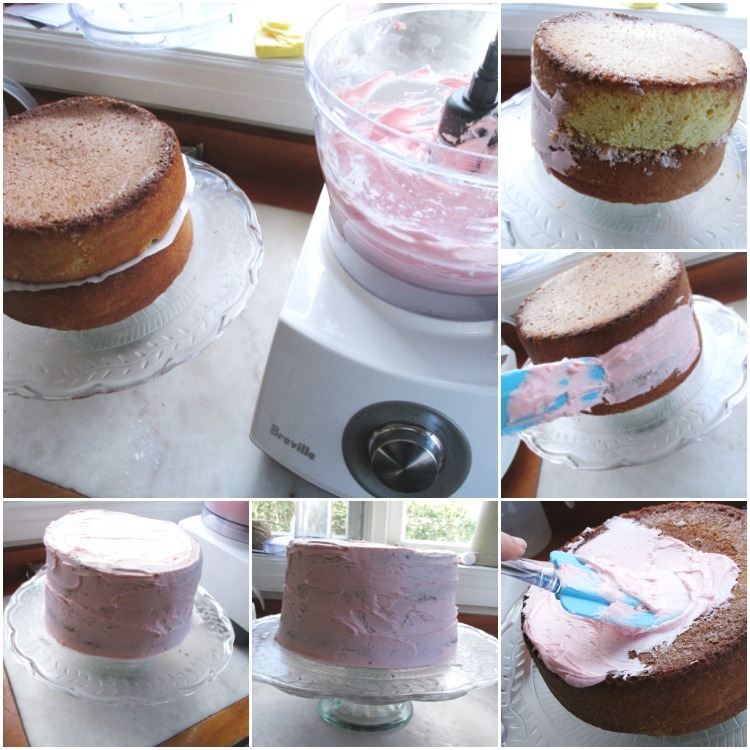 Read on, dear amateur cake maker - you can do this! First up let's create the birthday cake. 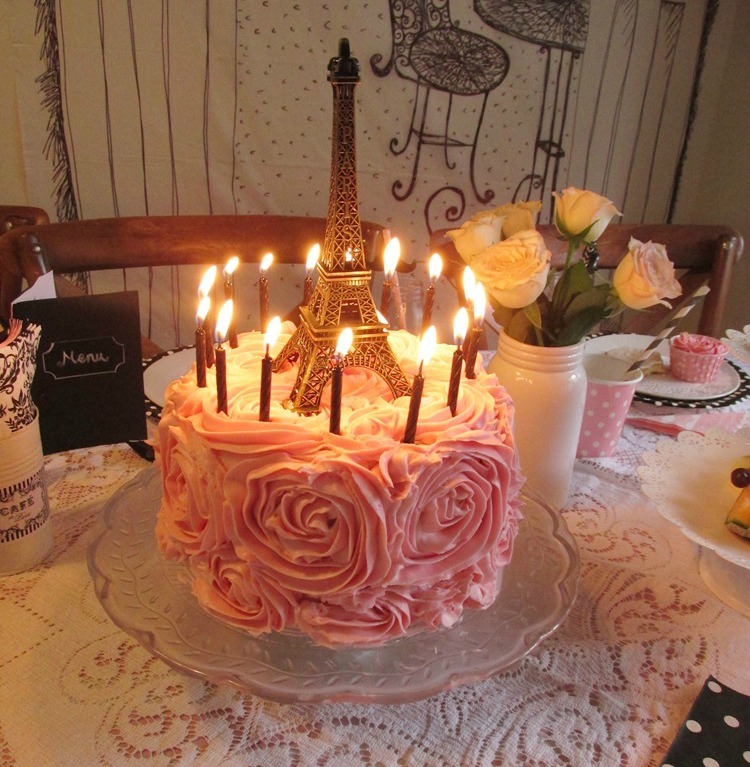 Our Paris Party cake looked gorgeous and impressed the birthday girl, guests and parents alike, in spite of my amateur rosettes (let's not pretend they are perfect - it's obvious they're not! I am far better at piping them now - that's what practise does for ya. But back in July when I created this party, I was just a beginner getting to grips with my new gear from Kiwicakes). 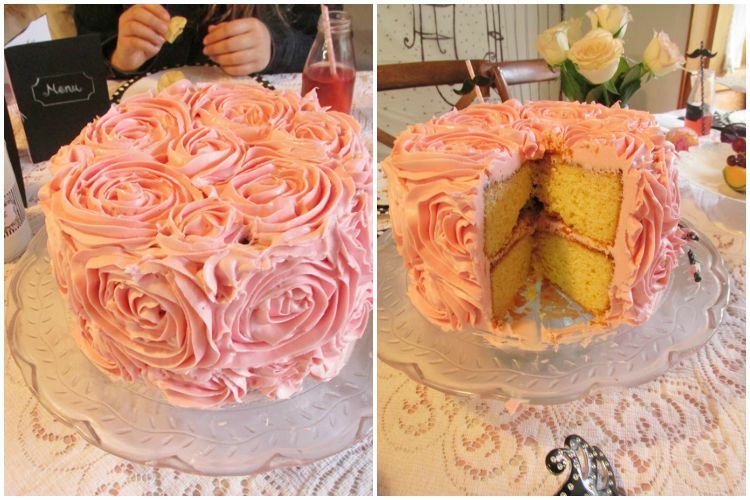 Once you have put the cake together and covered it with buttercream you are ready for the fun part - piping the rosettes. If you've never done this before you might want to practise piping them onto baking paper before you pipe them onto the cake. Fill your piping bag with buttercream, with the open tip attached. Begin in the centre of the rosette and then swirl outwards and around until you have a rosette. Scrape the buttercream back into the piping bag and keep practising until you have mastered the technique. Pretty stunning, right? Wobbly rosettes and all. Voila! Tres simple non? Next up, the Eiffel Tower Cupcakes. 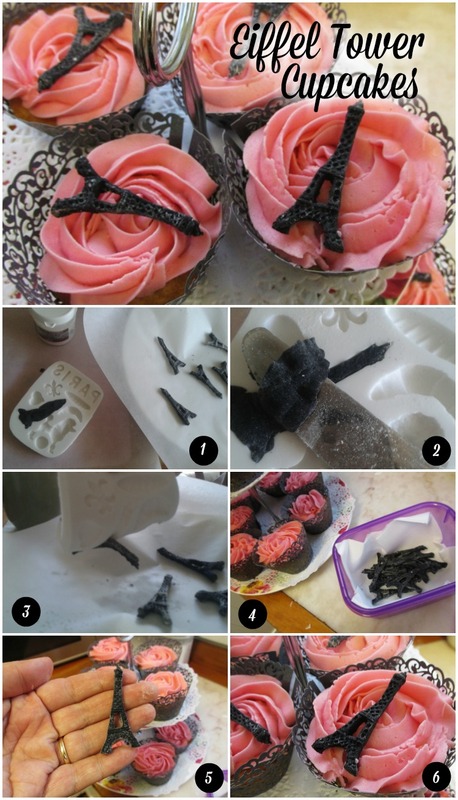 I learnt how to use the fondant mold to create edible cupcake toppers (like the Eiffel Tower) at our introduction to cupcake decorating at Kiwicakes last year. It might look complicated but it's really not. In fact, if you've ever played with playdough, it's no more complicated than that. And just like with playdough, if you mess it up, you can scrunch up your "dough" and start over. You can make the Eiffel tower toppers ahead of time, so they harden. To harden them more quickly, work a little Tylo powder into a small lump of fondant before you begin. If you do this, you'll need to work quickly as Tylo speeds up the hardening process. Dust the inside of your Eiffel Tower silicone mold with a little bit of cornflour (cornstarch) and then shake it out (this stops the fondant sticking). Break off a small lump of black fondant and press it into the mold, with the excess overlapping the edges. Use a straight-edge knife to slice away the excess as shown. Carefully bend the silicone mold until the Eiffel tower pops out. If it breaks or sticks on your first go, don't worry. Try again. When your Eiffel Tower pops out as it should, carefully lay it out on a sheet of baking paper to harden. Once hardened, pop into an airtight container until you need them. Bake a batch of basic vanilla cupcakes and allow to cool. Once cooled, wrap your "naked" cupcakes in something like these gorgeous laser-cut wrappers from Ali Express and then pipe a sweet buttercream rosette on top of each cupcake. Pop one on each cupcake... and Voila! Eiffel tower cupcakes. 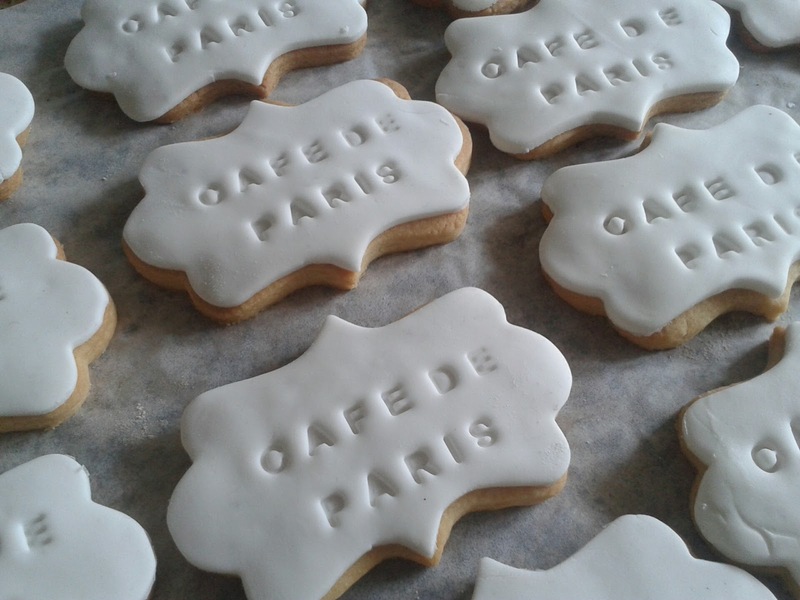 Last but not least we are ready to create our Café de Paris Cookies. I had originally planned to pipe each guest's name on a cookie and use these as edible place cards. I quickly realised that was way beyond my skills as a novice cookie decorator! 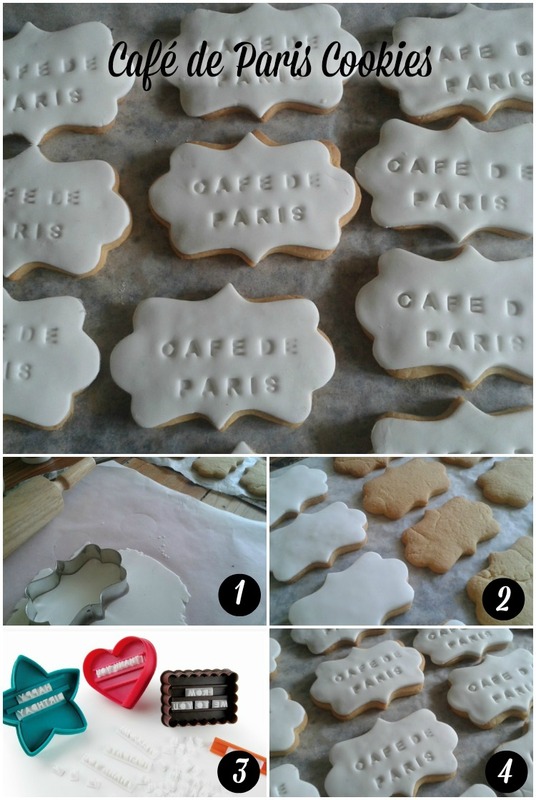 Then I came up with the idea of stamping each cookie simply, with "Café de Paris" - so much quicker and just as effective, in my opinion. As I said, I had been planning to pipe names onto each cookie, so I had bought the Flourish Rectangle Cookie cutter from Pop Roc Parties when I spotted it on sale. (It's now part of their hire collection). Firstly make a batch of basic sugar cookies. 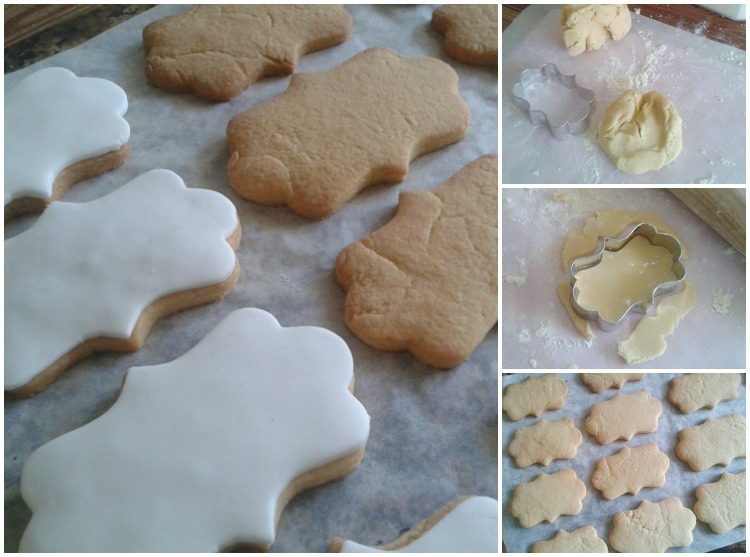 Roll out the dough and cut them out with the flourish (or scalloped) rectangle cookie cutter. Allow to cool. Roll out the white fondant on a sheet of baking paper (to prevent sticking) and cut out a fondant rectangle flourish (or scalloped rectangle) for each cookie. (Note: if you are using the scalloped rectangle from the letterpress set, you will be able to stamp your "Cafe de paris" lettering at the same time). Brush a little bit of water onto the back of each fondant rectangle and gently apply to the cookies. Load the letters into the letterpress stamper, to spell out "Cafe de Paris". Make sure you allow for a mirrored image! You might want to test it out first. Position stamper carefully over the cookie and press down, leaving the words imprinted on your cookie.